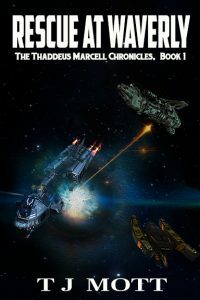 Thaddeus Marcell is an enigmatic mercenary and the leader of a secretive paramilitary fleet. His group operates in the galaxy’s Independent Regions, taking on contract work for some of the star empires, interstellar corporations, and pirate groups, fighting on their behalf whenever the pay is high enough. The very root of this story actually goes back to junior high school, when my friends and I would goof off in typing class and joke about being benign dictators of a planet in Alpha Centauri. I even wrote a few chapters back then, using myself and two of my best friends as the main characters and Presidents/Consuls/Generals of Alpha Centauri, although I've long since lost the 3.5" floppy disk that stored it. So after some really silly scenes written from an eighth-grade perspective on how the leaders of a star system might pass their time, one of the leaders discovers he's actually a robot who replaced the real character. Later on, the real character shows up in charge of a very powerful fleet carrying unimaginable technology. It turns out he'd been abducted some ten years prior, replaced by a robot (for reasons I never quite figured out), and sent out into a larger galaxy full of empires and wonders and technology that nobody at Alpha Centauri even knew existed. And while he was out there, he became some kind of notorious pirate and technology hoarder all while trying to find his way back home. As we grew up and moved into adulthood, I still had this basic idea in my mind, and I trimmed out the juvenile goofiness. At some point I decided it would be more interesting to write about the main character's adventures after being taken from his home, and how he became a notorious, grizzled pirate and mercenary and technology collector. Three or four years ago I decided I should actually do something with all of this. I wrote probably 20 variations on the first chapter, each time deleting it and starting from scratch with a completely different tone and perspective. At some point I changed him from a President of Alpha Centauri to a nobody from Earth. It seemed like a hobby that was going nowhere, but in mid-2016 I decided to take it seriously and began developing the story into its final form and shaping it into a novel. Rescue at Waverly builds upon much of the backstory I'd developed previously, while focusing on a dream I once had about a mercenary who goes on a rescue mission to save a woman he'd known years ago. And she's surprised to run into him again, wondering how he'd gone from a relative nobody to a self-made Admiral in a private mercenary organization. Rescue at Waverly is the first novel in what I hope to be a six-book arc. Once that main arc is done, I think I'll have enough material to branch out and explore other areas of the same story universe. The biggest characters assume portions of my own personality. I'd amplify some of my own traits and remove others to get a baseline for each character. That actually made the writing very easy because in a way I was writing about twisted and exaggerated versions of myself. For example, I took my own obsessive and isolationist tendencies, added in some of my own experience with depression, strengthened all of this and turned it into Thaddeus, the main character. And many of his actions were a result of me wondering how I'd handle the situation if my own moral compass was much, much weaker. Another character, Commodore Cooper, is a fun-loving guy who finds everything amusing and is always in the middle of a whirlwind of juvenile pranks–basically me in college. The starship pilot, Amanda Poulsen, is always pushing herself to prove herself the best, a result of her upbringing where she thought she was told she wasn't good enough to ever amount to anything in life, which is an attitude I can somewhat identify with. Overall, it was a good–but probably naive–starting point for my characters, but as I became more experienced I was able to shift to writing about characters that have very little in common with me, which was an important growth in my writing that's proving really important in the sequels I'm working on. As I branched out to create characters that were not a warped version of me, I did a ton of research. I came up with lists of positive and negative personality traits for each character, reading about the effects those traits tend to have on people and how it filters their perceptions of the world. I read Wikipedia articles on psychology, watched interviews on YouTube, and so on, to get the perspectives of real people who have been through very painful situations that could be analogous to my characters. And the end result of that is that each of my characters is a really messed up individual, with thoughts and actions and attitudes that are guided by a few painful events from their past. Some of them desire to move past the pain, some get stuck in it, and some do everything they can to forget about it and avoid anything that might remind them. So I try to take my characters pretty seriously. Even though it's science fiction, that aspect almost takes a backseat in my mind when I consider the story arc. To me it's about people struggling through the pains of life, rather than starships and hyperspace and giant laser guns. Thaddeus’s two remaining starships sat a small fraction of a light-year away from the Waverly Depot, having barely jumped in time to escape the squadron. Their rest would be short though. Attacking the Depot from within had bought him the time he needed to board the Cassandra, but now that action was a liability. Soon, he knew, every armed vessel in the system with hyperspace capability would be following. He was still seated inside the Marine transport. It and the Caracal’s hangar were completely depressurized. The transports’ hatches were already open, but the Marines were waiting for atmosphere to return before disembarking the craft. He looked around at the cramped vessel. Normally, it could seat two eight-man squads plus the transport’s standard crew of four. But it didn’t have enough seating for the six extra members, and so several Marines stood in the aisle to make room for Adelia and the medics. She sat in a jumpseat near the aft end of the cabin, flanked by the medics, with her helmeted head hung low and her chin resting on her chest. The oversized pressure suit shook visibly as she shivered within it. Her comm was switched off to keep from exposing her to the platoon’s chatter during the raid, and without atmosphere to relay sound Thad did not know if she was talking, crying, or just sitting in silence. As he watched her, he felt cold inside. Gone was the anxiety and anticipation he had felt before. Neither did he feel any sense of accomplishment or relief. Instead, he felt tired and emotionally numb. The scene seemed so surreal to him, as if it couldn’t possibly be real, as if it was just one more dream in that long line of recurrent dreams where he finally found something to lead him to Earth. Part of him feared that he’d soon wake up and find himself soaked in a cold sweat back in his bed on Headquarters, no closer to locating Earth than before, and again cursing his subconscious mind for tormenting him in his dreams. He stood uneasily and then slowly made his way through the crowded cabin, pushing past the standing Marines. Every muscle in his legs burned in protest with each step. He knelt down on the deck in front of Adelia, with his head about level with hers, and gently picked up one of her trembling, gloved hands from her knee and held it between his. She didn’t react at all. His thick armored gauntlets dwarfed her thin gloves. He fumbled with the comm controls on her wrist, and despite the low dexterity of the gauntlets he managed to open a direct channel to her, and suddenly, her quiet sobbing filled his helmet. She didn’t respond, and he watched and waited in pained silence, listening to her cry softly over the comm and giving her hand the occasional reassuring squeeze. Then, Thaddeus felt his ears pop, and he saw the pressurized armor suits around him deflate slightly around their softer areas. Air was returning to the hangar. A couple minutes later, Rossell gave the order to disembark. The medics were the first off the transport. They held Adelia up and pushed her along as she stumbled towards the exit. Thaddeus followed close behind. The transport was parked up against the rear wall of the hangar and already secured to the deck. A nearby hatch into the frigate’s interior opened and more medical staff burst in, rolling a gurney ahead of themselves. They laid her down on it and then fumbled with the releases on her helmet. Thad watched as her tousled dark hair poured out of the helmet. Her face was red and wet with tears, her cheeks puffy and bruised, her eyes tired and unfocused and seemingly not aware of her environment. They began to roll her to the exit. Thad took a step to follow when suddenly Bennett’s voice piped into the helmet he still wore. “Admiral Marcell, we need you in the Command Center ASAP,” the Executive Officer said rigidly. He sounded angry, his tone conveying utter contempt as he spoke Thad’s name and rank, and his voice was uncharacteristically nervous and high-pitched. He followed them through the hatch, exiting the hangar and entering one of the Caracal’s corridors. The medics turned into the passage and continued rolling Adelia towards the infirmary. Thad stopped and watched, keeping his eyes locked on Adelia for as long as he could. They disappeared around a corner. “On my way,” he growled before turning, going the opposite direction from the infirmary.